I want to start a new series of blogs to talk about words that I frequently use in Ancient Scripts but sometimes ended up poorly defined because I don't want to make the pages go on too many tangents. Ultimately when I have enough of these "Word of the Day" posts I will collate them into a glossary in Ancient Scripts. Anyway, here goes the first one. Back in the day (yes I am THAT old) when we had books and computer screens of only 80 columns by 25 rows, I've never lost my place in a long paragraph. However, now that we have wide displays with high resolution, texts can span for 15 inches! When I reach the end of a line and move my eyes back to the left of the screen to the beginning of the next line, I lose my position in the text! It'd take me a few seconds to get context back and find the right line. It's extremely annoying. My solution? Bring back boustrophedon! What is this boustrophedon thing you ask? It's not some high-tech fancy gadget, but instead an ancient way of alternating the direction of writing. In the history of the Greek alphabet, there was a transitional period between the right-to-left direction inherited from Phoenician and the better known left-to-right direction where texts were written in both directions, alternating every line. The letters themselves appeared mirrored depending on the direction of writing. In the example above, the grey dotted arrows indicate the direction of reading. The first line of the text starts on the left and goes to the right, then continues immediately on the right and goes back to the left. You can imagine a farmer plowing a field with an ox, and when he gets to one end of the field, he turns his ox around and goes in the opposite direction to plow the next row of his field. This is in fact the meaning of boustrophedon, which means "turning of the ox" in Greek. Rongorongo tablets employed an even more extreme for of boustrophedon called reverse boustrophedon. The glyphs are mirrored both horizontally and vertically, or in other words, rotated 180° every line. The idea, perhaps, was to read one line, turn the tablet 180° upside-down and read the next line. 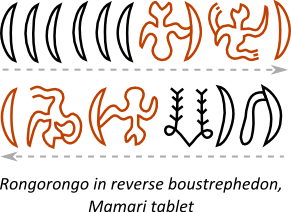 On the example to the left, you can see that the brown glyphs are the same on both line, but they are upside down and mirrored. 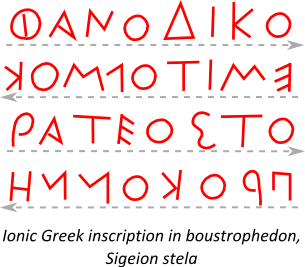 If anything, this style of boustrophedon fits the meaning of the name much better because the ox and the farmer really do turn 180° each time. If we take this analogy of "ox turning" to ridiculous heights, then perhaps the most efficient kind of plowing (and writing) would to continuously turn in a circular surface. You might think this is contrived but I have seen verdant circular fields when flying over agricultural heartlands of America. Granted these fields are plowed and irrigated by machines, but the same logic of efficiency holds for writing as well. There is no interruption when the scribe arrives at the end of the line to move down one line. Instead he/she continuously turns the circular surface until he/she runs out of space. And somebody precisely thought of this principle 3700 years ago. 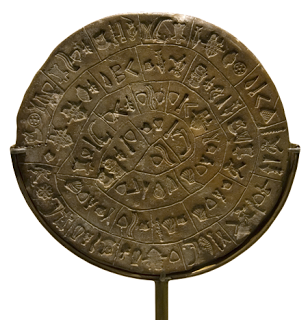 The Phaistos Disc (pictured to the right) is a one-of-a-kind artifact, the only example of a stamped text starting from the outside of the disc and spirals inward in a counterclockwise direction until the text terminates at the very center of the disc. Actually the disc is still undeciphered. The direction of writing is inferred from physical characteristics of the signs themselves. I just noticed that this Blogger layout I chose is quite narrow. You probably read this whole post without losing your place in the text even once. I guess I've self-defeated my arguments to bring boustrophedon back. Oh well! Next time let's try to bring back logograms.